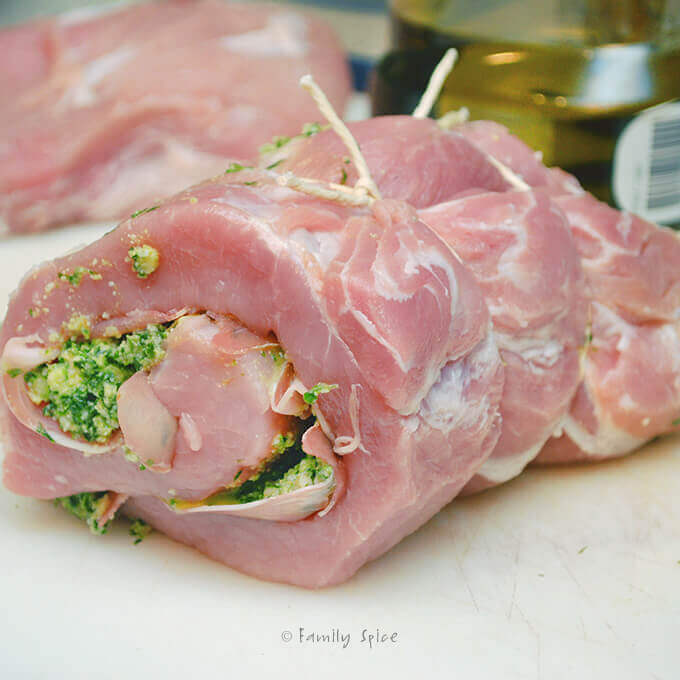 Whether for a special occasion or an everyday meal, this Italian Pork Roast Stuffed with Prosciutto and Basil Pesto is super easy to make and full of incredible flavor. 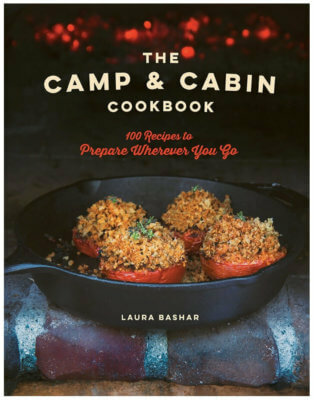 I am always on the look out for terrific recipes that my whole family would love. The balance of trying to make the meal affordable and appetizing for all five of us is a tricky game to play. But my latest find is the pork roast, which can be prepared a number of different ways with a number of a different flavor options. My favorite cut of meat to use for this Italian Pork Roast is the big 8-9 lb pork loin from Costco that costs around $20. 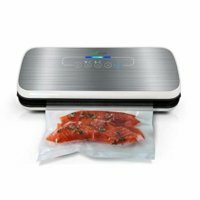 It is such a fabulous deal especially for us big families who have to cook on a budget. The pork loin is much larger than the pork tenderloin but is just as tender and juicy. I usually cut this large pork loin into thirds, and vacuum seal the other two pieces to freeze for later use. Each pork loin third that I cut now weighs about 2.5 pounds, making it a great meal option for my family. The only thing for me to do to make this Italian Pork Roast is to butterfly the pork loin. You are basically slicing your roast but not all the way and pulling up and opening the roast like a page of a book. It sounds more complicated than it is, trust me. Once your pork roast is open and one flat piece of meat, approximately 1/4-1/2 inch thick, you can layer in the Italian stuffing. You can use almost any kind of stuffing for your pork loin roast. Now you can see why I love preparing this dish? The flavor options are limitless: chimichurri, pesto, cranberry sauce, marinara…. Love fresh herbs? I have a fabulous recipe for Grilled Pork Roast with Garlic and Rosemary, too. 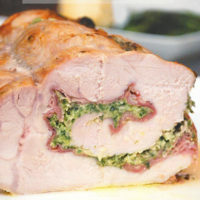 The flavors I used for this Italian pork roast were simple: homemade pesto with walnuts and proscuitto. That’s it. So simple but oh so full of flavor. You can use store bought pesto or homemade which makes this dish even easier to prepare. Once the roast is butterflied and covered with and pesto, I rolled up the tenderloin, covered it with olive oil, seasoned it with salt and paper, and then tied it with kitchen twine. Again, no fancy culinary skills are required to do this. I tied the twine in 2-inch intervals along the roast. 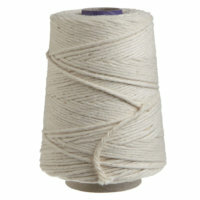 You only need just enough twine to hold the roast together. You can cook your Italian pork roast both in the oven or on the grill. I have included both instructions in the recipe card below. 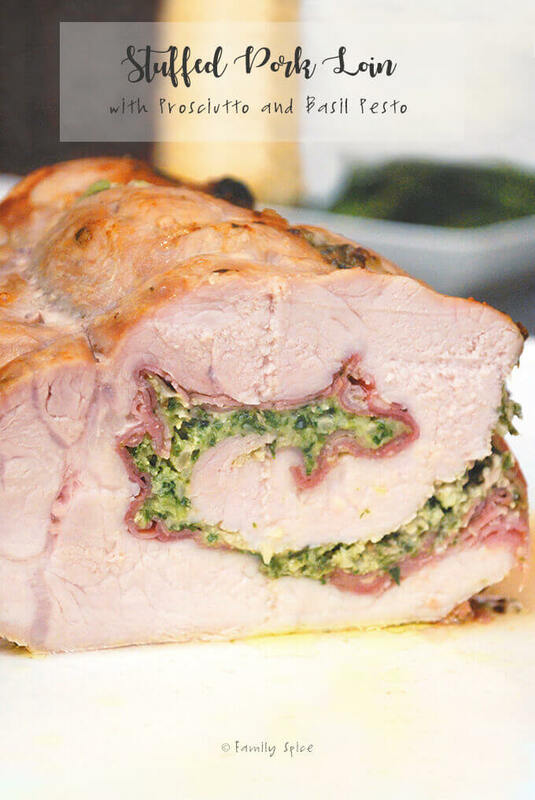 Whether for a special occasion or an everyday meal, this Italian Pork Roast Stuffed with Prosciutto and Basil Pesto is easy to make and full of flavor. 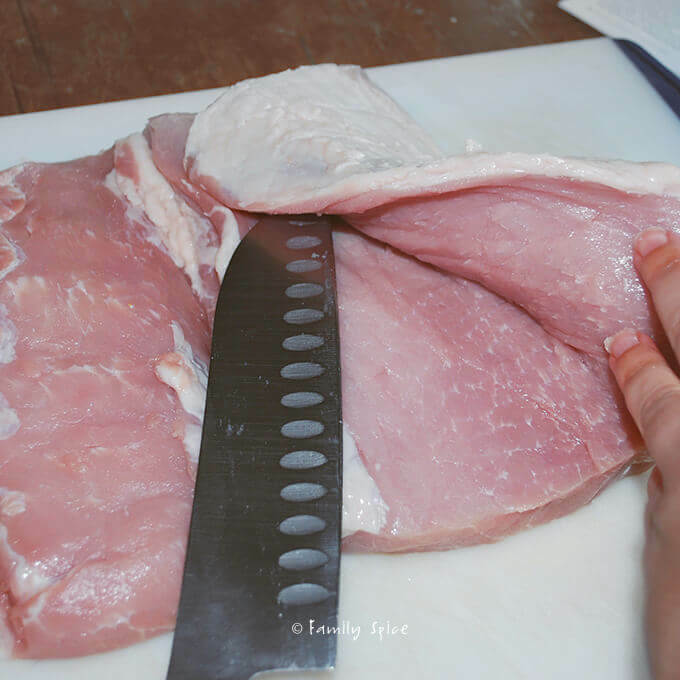 Using a knife, score the fat on top of pork loin. Starting about 1 inch up from cutting board, cut horizontally down, stopping about 1/2 inch before the edge. 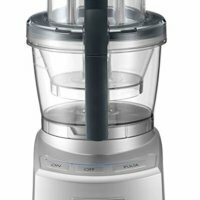 Add basil, walnuts and garlic into a food processor and purée until smooth. Slowly pour in 1/3 cup olive oil and process until oil is emulsified and pesto holds together. Open butterflied roast and layer prosciutto over it. 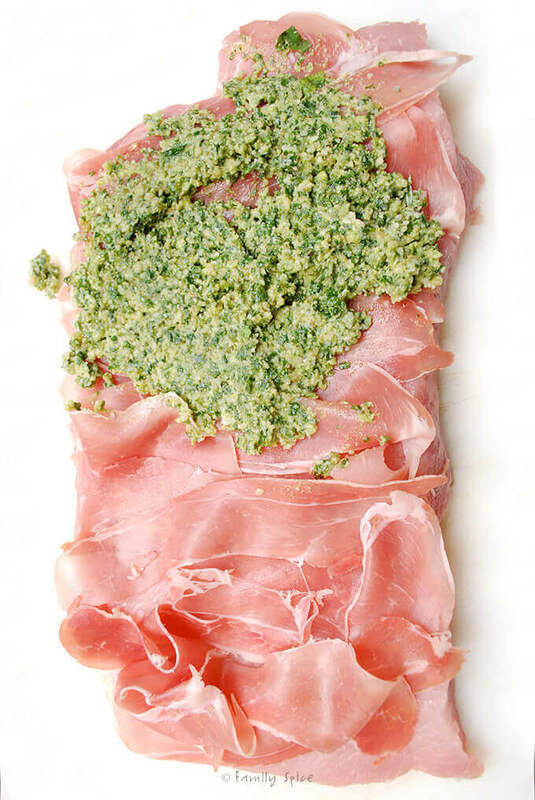 Spread pesto mixture evenly over the prosciutto. Roast can be wrapped tightly with plastic wrap and refrigerated for 24 hours at this point. Coat the outside of the roast with 1 TBS olive oil and season with salt and pepper. If cooking in the oven, preheat to 350ºF. 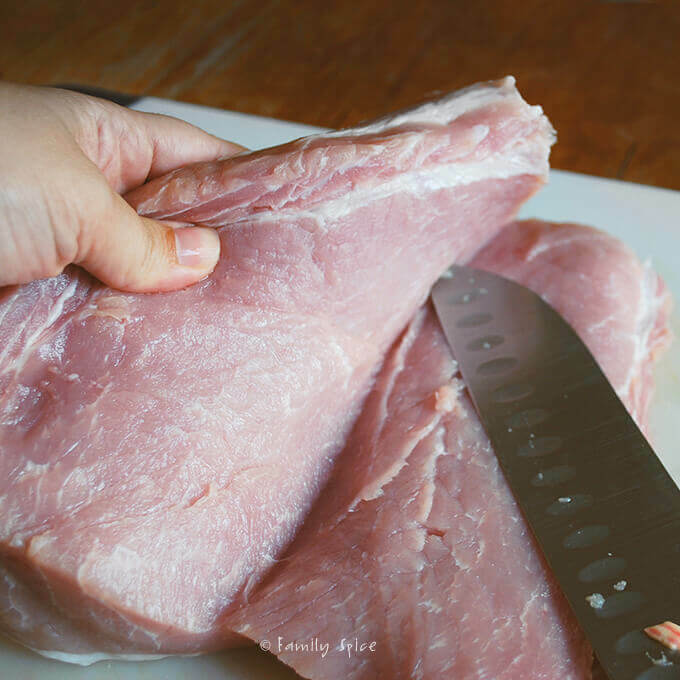 Place pork in a roasting pan and roast 40 minutes, or until meat thermometer reaches 140ºF, approximately 30 minutes. Skip to step 18. If grilling, preheat grill with all burners on high for 10 minutes, with lid closed. Scrape and oil cooking grate. Scoring the fat encourages it to melt and baste the roast during cooking. If you must trim the fat, leave a little bit remaining otherwise your roast will easily dry out. By first grilling the roast at high heat, the outside of the meat is browned and seared, sealing in the pork's juices. Continuing to grill the pork on the cooler side of the grill allows for slower cooking, which keeps the meat from drying out. This pork looks delicious – and gorgeous! Well done :). I just made this pork roast and it was AMAZING. So simple, yet so full of flavor. Thanks for another winner! Karen, I'm so glad you liked it!